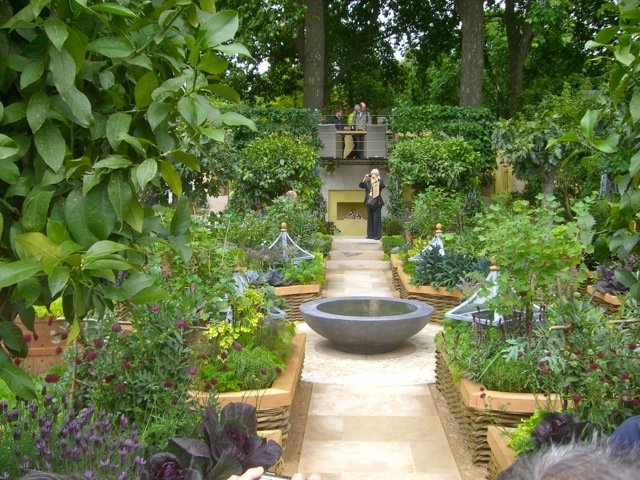 This was probably the most difficult of all the show gardens to take in all at once. It was only open on two sides. The "back" was a two-level deck/glass platform. The lower level had built-in bench seating around a contemporary fireplace. The second floor was a dining table surrounded in waist-high glass walls. 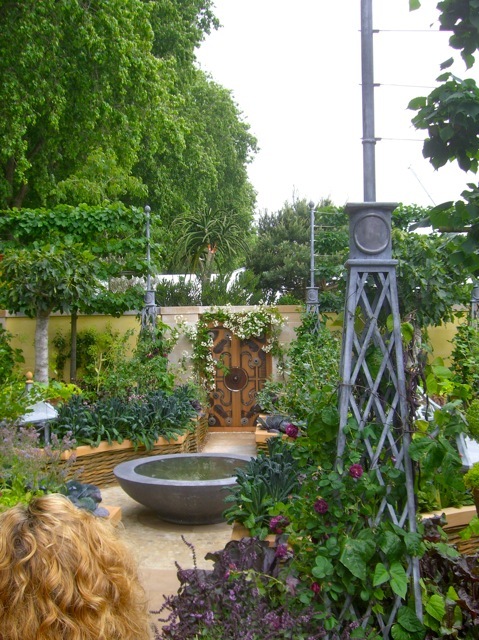 The whole thing was floating - seemingly supported by espaliered fruit trees that masked the actual weight-bearing supports. Even the second floor of the deck was glass. This is NOT a handy-man weekend project! I saw the video here first, before I went to Chelsea. 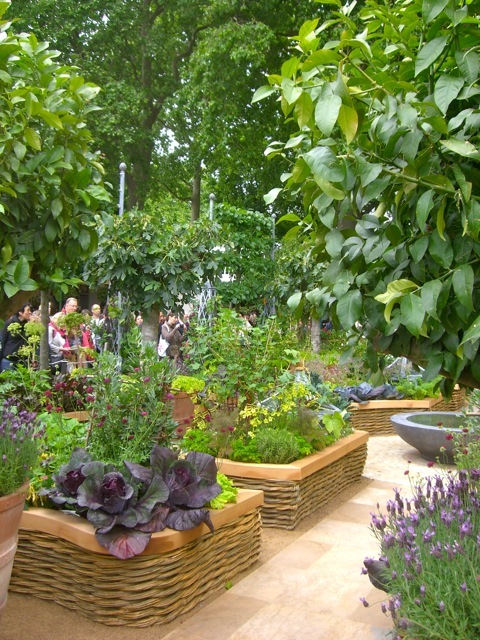 The The M&G Bank garden seemed like a winner -- the ultimate potager garden or "modern kitchen garden." 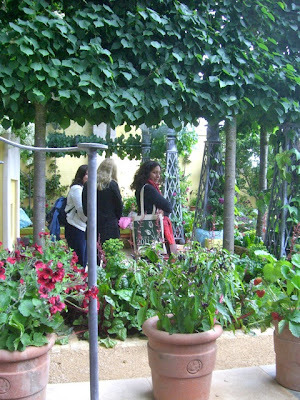 But cripes, some great ideas and a big budget, and how can you go wrong? 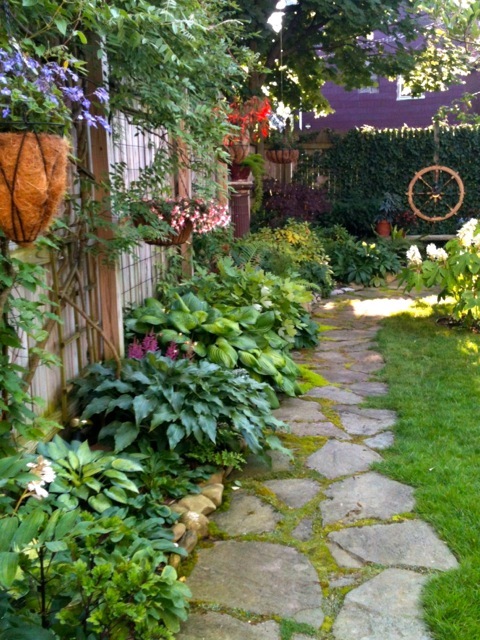 It had everything I would put in my own backyard – given the money and the space. Time? Not so much of an issue if you can bring in mature pleached trees, willow-weaved raised beds, immense specially-embossed terracotta pots with trees, full sized trees and fruits and vegetables all at peak (even if it isn't even close to their season). 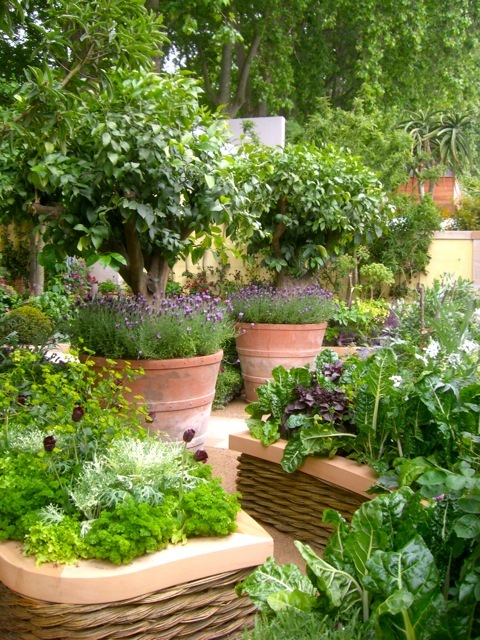 The rest of the garden, in front of this space, was all in containers -- the beautiful basket-weave raised beds and planters. 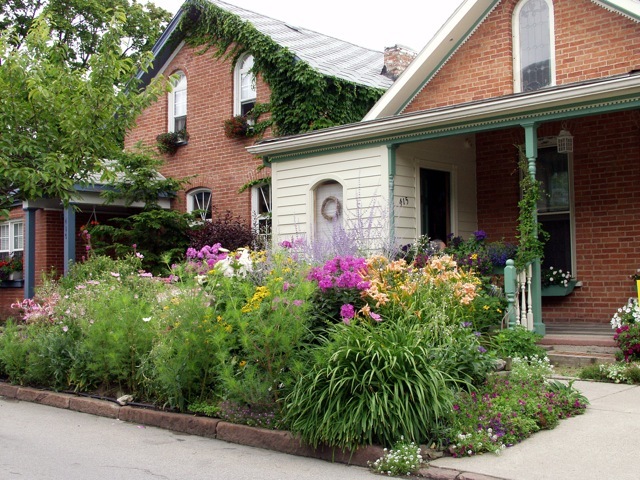 Everything in the garden was intended to be productive: lemon, fig, apple pear and lime trees; kale, beans, peppers, squash, chard, artichoke and lettuce; chives, dill, tarragon, fennel, mint, parsley & sage; lavender, thistle, loosestrife and other flowers to attract beneficial insects. 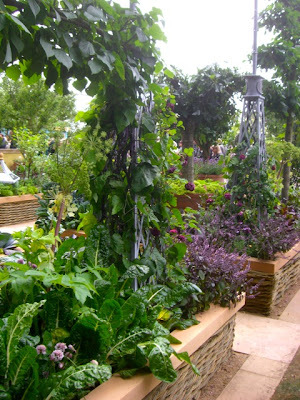 Full planting guide found here. To see a 360-degree view of the garden and videos of it, visit the Royal Horticultural Society's site, here. matching the pylon ironwork used throughout the garden. my favorite feature. I have to do more and more interesting underplanting. 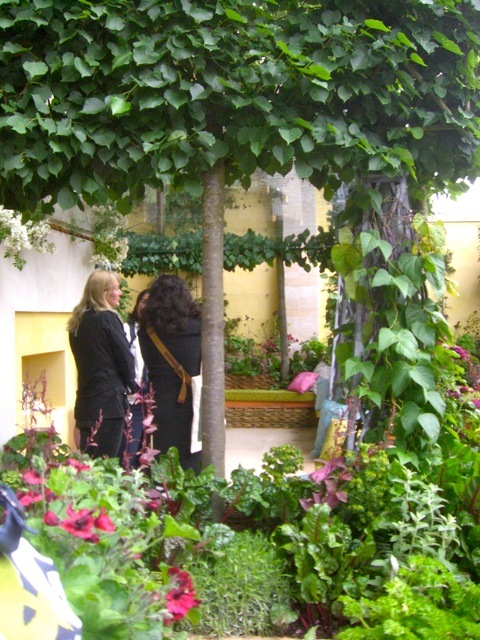 Here you can better see the seating, and hidden deck supports covered in ironwork and vine. That's the glass "roof" reflection at the top of the photo, below the leaves. Probably not a good idea to wear a skirt when you're upstairs. 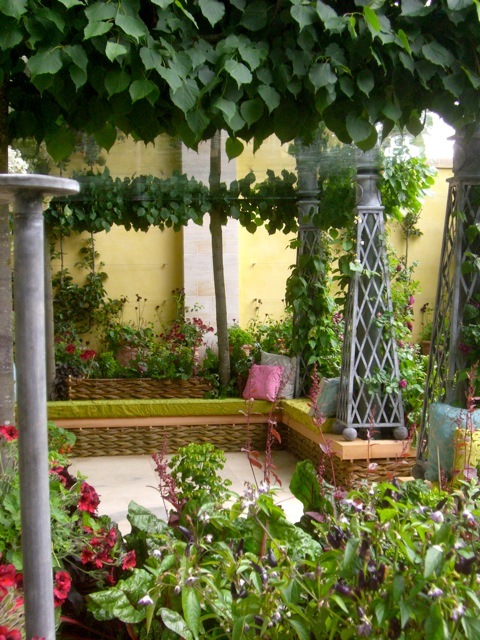 Loved, loved, loved the willow-weave raised beds! 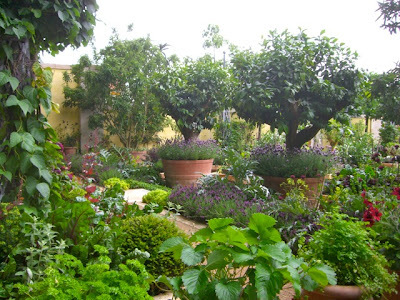 from this side perspective of the garden. 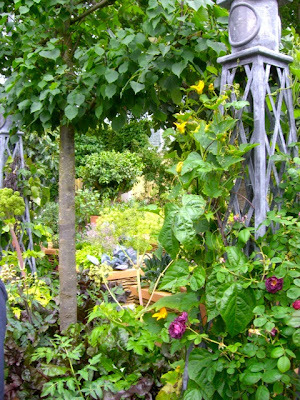 Pylons here used for climbing vegetables like scarlet runner beans. 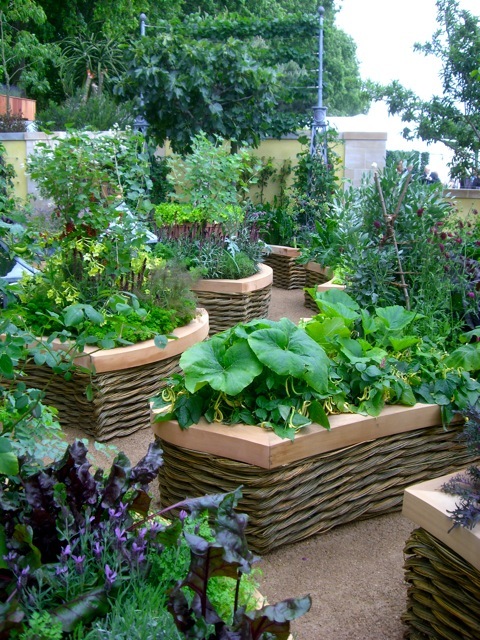 Couldn't get enough of the basket weave beds & underplanted lavender. You can see a bit of the glass ceiling in this shot. This was so densely-planted that the textures looked great from any angle. yummy times ten to the power of 3. 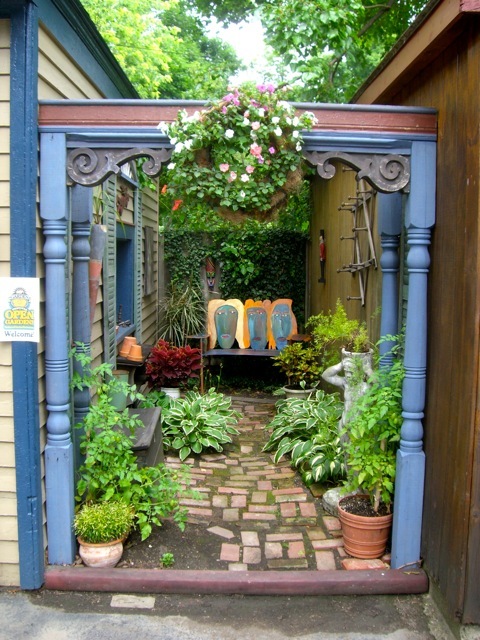 Such a fantasy garden. Wonder how much room we'd need to have in the garage to house all that shattery stuff over the winter. I think I'm in love! 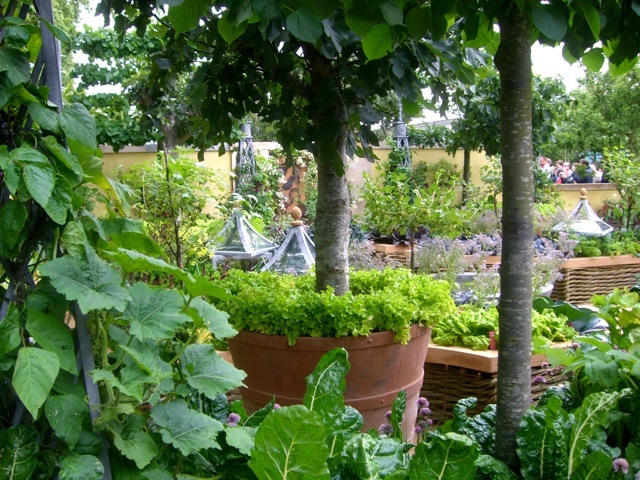 Especially envy the huge terra cotta pots with the fruit trees and underplanting.